This ancient village was once known as Huehuetlapayán, Hueytlató, or Primitiva Tula. In the second half of the 11th Century, it was incorporated into the kingdom of Payaquí, founded by the ancient and venerable Topilzín Aexitl, and as of that period, produced a strong interbreeding between the native Maya–Chortis peoples and the emigrating Toltecs. This interbreeding was such that at the dawn of the 16th Century, the inhabitants of Citalá spoke neither the Chorti nor Nauta dialects, but rather a single language: Alagüilak. In the political order established by the Spanish, Citalá was a feudal village of Gales, the supreme chief of Copán. The region was conquered and brought into the Spanish royal domain by the conquistadors Hernando de Chávez and Pedro Amalín, who triumphed in their assault on the city of Copán after a prolonged siege and many bloody battles. King Gales fled the massacre in Copán and established his barracks in the fortified city of Citalá. Here he and his soldiers mounted a heroic, but ultimately doomed, resistance to the fair-haired invaders from overseas. These wars of conquest reduced the population considerably. By the year 1550, the ancient grand metropolis of the Maya–Chorti had scarcely more than 800 inhabitants. 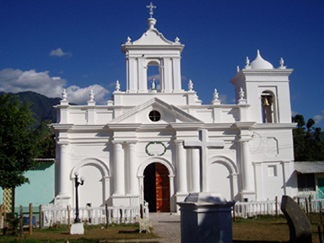 In 1770 the archbishop Pedro Cortés y Larraz relates that the town of Citalá was annexed to the curate of the village of Tejutla, and that its total indigenous population was represented by 167 people distributed among 27 families. The quartermaster Antonio Gutiérrez and Ulloa reported that in 1807, his principal harvest was of sugar, and that he was situated in the royal road for Comayagua (Honduras). From 1824 (June 12) to 1833 (May 13), Citalá belonged to the department of San Salvador; from 1833 (October 21) to 1835 (May 22) to the department of San Salvador; from 1835 (May 22) to 1855 (February 14) to the department of Cuscatlán; and as of the latter date to the department of Chalatenango. By 1890, its population had risen to 1,850 inhabitants. Documents from 1890 refer to Citalá as simply a village, but one document dated October 1892 refers to it as having the rank of town, a rank gained during the administration of General Carlos Ezeta. From February 19, 1854, to March 1846, Citalá was included in the jurisdiction of the Metapán valley of Montenegro, and was definitively separated in the latter date. Under a law passed on April 29, 1925, the municipality of Citalá was legally separated, while the city of Metapán incorporated the outlying districts of Camulián and Las Pavas. The church was built in the year 1892 (or in this year, the estate in which the church is located was acquired). The church used to belong to the jurisdiction of La Palma. In actual practice it has been administered by the Franciscan mothers. Until the year 1997, it was looked after by the presbyter Ildefonso Mejía, and from the same year onward, by the presbyter Rodin Ramírez. Alongside the southeast, visible from the end, is the tallest elevation in the country, that is, the peak of El Pital. Its owner is the Catholic Church of El Salvador. From November 30 to December 8 are the patron saint festivals in honor of the Immaculate Virgin Conception of Mary. Since its beginning it has been used for religious purposes. Based on town plants drawn up by the Spaniards, which began with the grand plaza, in whose surroundings was located the church, the town hall, and the houses of the first inhabitants, one can assert that in the beginning of the 20th Century, these plazas began to be transformed into parks, that is, with their spatial dimensions and uses transformed. In this park, located in front of the principal entrance of the parochial church, is located a cross dating from the year 1982. Furthermore, there are three trees DE AMATE that provide shade for residents and visitors. The church and the park have as their visual end point the tallest elevation in El Salvador, that is, the peak of El Pital. Parochial convent is constructed with the help of Archbishop Pérez Aguilar. Salvador Mendieta Middle School begins operations, with 1st and 2nd grade classes offered and two teachers. The Actual School is constructed. Before construction of the hammock bridge, people crossed the river in big PEROLES with the help of swimmers, but also owing to the water of the river, which flowed gently. Later a carpenter constructed a CAYUCO, but it did not work, and upon placing it in the water it sank. Until 1945 construction of the hammock bridge continued. Club of Monte Cristo is founded. Kindergarden of Citalá is founded under the charge of professor Argentina Carballo. Health clinic is established through donations from the municipal office. National Institute of Citalá is founded. Bridge is constructed under the watch of President Ing. José Napoleón Duarte. Building of cobblestone roads begins in Citalá. The municipal office launches the official website of Citalá, a cornerstone of a new era of modern administration.